A it´s a PENTHOUSE apartment. with excellent SEA and mountain views from its large private 18 m2 terrace. Located in a quiet residential resort in Playa del Cura. Ideal for relaxing, enjoying a romantic holiday or sports. The resort has a grocery store, a bar-pool where. There is a Canarian Tapas Bar at first floor with marvellous terrace, a German bakery, a little food shop , a Haidresser and a Restaurant in the resort. Morning reception. Tennis and a Bar at the upper pools. The beach is reached within 5 minutes walk and the second beach called Amadores of white sand it´s a two km. Also nearby is the golf GOLF Anfi Tauro and highway access. There is bus service and taxis to visit the nearby Puerto de Mogan, Puerto Rico, Las Palmas city and the airport. Sliding the photos above, find a video with magnificent views. Please contact us at any time...sometimes there are last minute cancellations, feel free to have a look at all different profiles, descriptions, prices and availabilities. All my units have same breathtaking Sea views to enjoy Sunrise. Unit ( A ) it´s a PENTHOUSE apartment. We will send you more Info vía Email. From landing till you arrive in resort it can take to 2 hours. Arrivals after 21 hour are not possible, reception is closed. Check out time: At 11am in the morning. In case there are no new arrivals, you could remain a little longer, please check a day before. Rent is selfcatering, there is no room cleaning and no change of white linen or towels, we provide you with 2 sets and washingmachine. 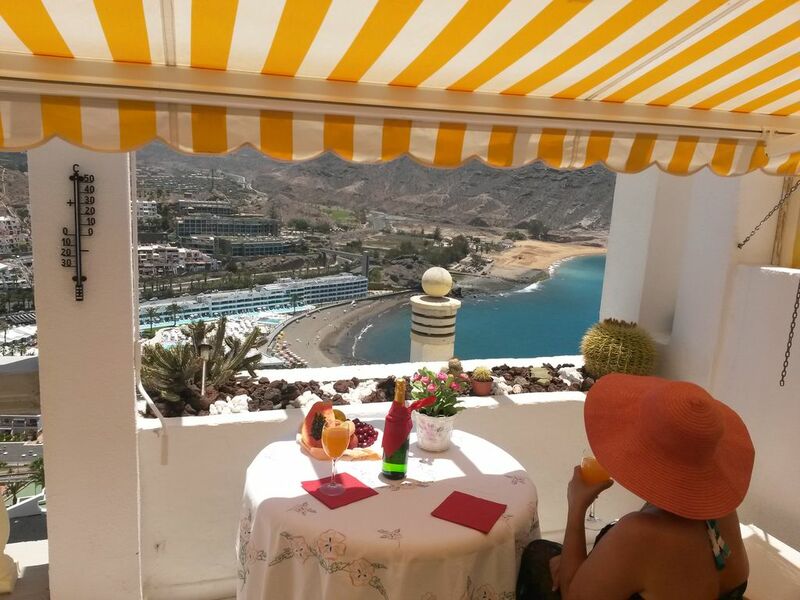 The properties are located in a residential resort on a hillside of Playa Del Cura overlooking the village and the beach, with excellent view over the Ocean and surrounding mountains. ten minutes from the lively Puerto Rico district on the south coast of Gran Canaria. You can enjoy the sun rising behind the mountains while having breakfast on the terrace. -The view from the apartments is really breathtaking. The bedroom has 2 single beds and patio doors. Livingroom with sofa-couch. Big private terrace with 18 m2 with two sun loungers, table and chairs. The resort has 4 swimming pools, tennis court and a bar on top of the resort. Restaurant, Tapas Bar are located on the first floor serving lovely dishes. -There is a small shopping center with restaurants, bars, pharmacy and a big supermarket, open daily until 21, only 5 minutes’ walk down the hill. It is a peaceful resort set in a relaxing surrounding with every facility you might need to make your holiday perfect. We prefer a written communication for better understanding. Please feel free to write us an email and ask any question you may have. We are also using what´s app. Smoking is not permitted inside the Apartments. There is a free public parking area just outside the resort along the street. We speak Spanish, English and German. Appartment are located in the same resort and have ALL wonderful views, are very well equipped, clean, tidy and maintained. Breathtaking Ocean Views, well equiped, clean, cousy. Check in -out flexibility whenever possible. Formality. Whatsapp contact too. Shower bathrrom with hair dryer. There is wifi for free at the resort for leisure use only, nor reliable workwise, signal is weak and goes off some now and then. I thank you very much for choosing one of my apartments. Fortunately lifts are back on order. I wish you peace and harmony and hope to hear of you soon. Jasmines apartment is lovely with everything you need for a self catering holiday. The views are amazing and you can hear the waves crashing into the shore if you leave the windows open at night. The complex its on has three pools but the one on the same level as the apartment is the best we thought it has a waterslide too. The sun went off the balcony at 3-4 o clock when we were there in September, so if we werent out somewhere we went to the pool or down to the beach late afternoon. Theres a great bus service if you dont want to drive or the taxis are also good. You can go into Puerto Rico by bus or taxi and get a ferry from there to Puerto Mogan which is a beautiful seaside town with a marina, they have a market there on Fridays. To get anywhere you have to go down the hill from the apartments, at the bottom there is a little precinct with a few bars, restaurants and a Spar. The only problem is you have to walk back up the hill with your shopping, they do deliver but we didnt bother with it. There is a little shop in the complex which does basic stuff but only open in the mornings, theres also a bar and a restaurant which we had a meal in and it was very nice. The apartment does have wifi but it was so bad we didnt bother with it in the end I just bought more data and used that. All in all we probably would go back but the it would be better with a seperate router in the apartment for better wifi. I thank you very much for your time and review. I ´m glad to inform you that since thursday there has been set a private router for Internet in this property of mine as I had already ordered before you came, but you know things overhere go slowly, that´s why we´re relaxed at the other hand. I wish you love and harmony and hope to hear soon of you again, you could contact me directly to book. A very nice, clean and fresh apartment. with breathtaking view from a large terrace. Equipped with a washing machine. Good location, near to local bus and small commercial center with supermarket and restaurants. I can highly recommend this facility and apartment. I hope to hear from you again in a future. We have been in the same appartment twice now and we will probably be back again. The appartment is nice and clean. There is everything you need for 2 persons and the surroundings a very nice and quiet. We just love the view. We had a very pleasent stay at this wunderfull appartment. Hope to see you again some time soon. We have a great week in this apartment! It have room enough for two people, was cleaned properly on arrival, and the inventory was complete. Because we had beautiful weather, from early morning until late evening we could sit outside on the lovely terrace. It is a great quiet place, outside the crowded environment of Maspalomas and Playa des Ingles. We found that very nice! In the evening you sometimes hear the live music from Playa de Cura until eleven / twelve o'clock. But at night we didn't hear much more than the silence of the sea. Electric cooking was for us a challenge. But there is also an excellent restaurant where we have had a nice dinner! In short: an apartment where we definitely go back! And a special word of thanks for Jasmine who was very flexible and showed great hospitality to us! It's me the one who has to thank you for trusting me and choosen my apartment to spend your holidays. Hope to see you soon. Es war schön. Schöne Appartement. Näschtes mal Sie können direkt bei mir per Mail buchen, Sie haben mein whatsapp. Ich bedanke mich und würde mich freuen von Ihnen bald wieder hören zu dürfen. Ich wüsnche Sie alles gute bis dann. Golf, beach, tranquility and relaxation. Water activities include parasailing, jet ski, sailing, diving, whale and dolphins watching.